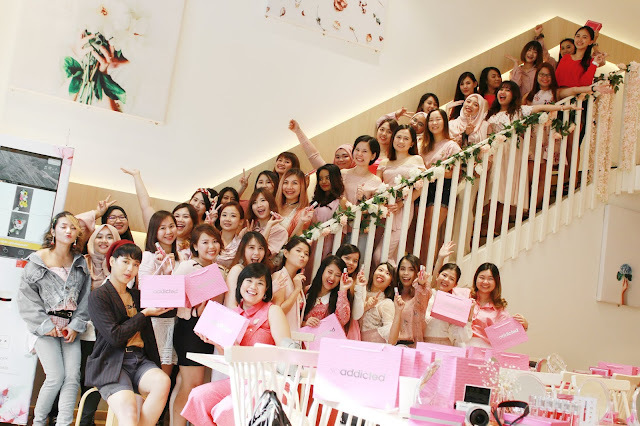 For today's post I'll be sharing about the LipAddict Tea Party that I've attended during the end of last month! 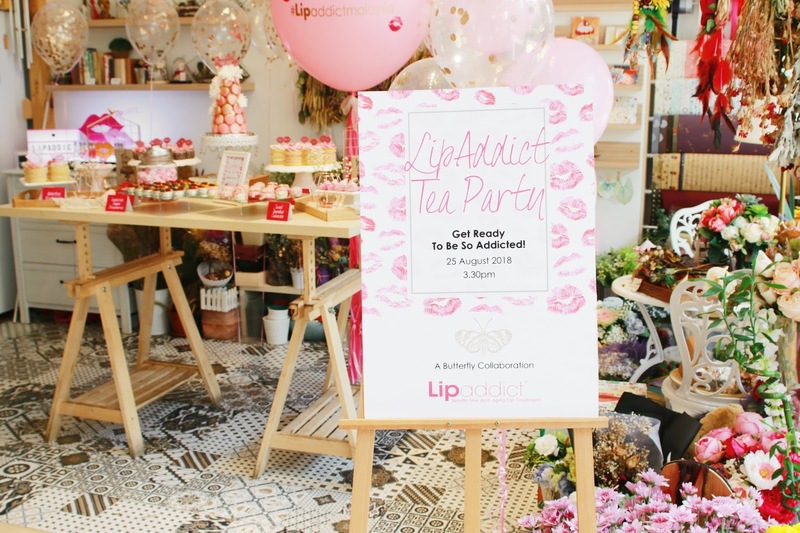 It's actually a very SWEET tea party organised by SoAddicted team and The Butterfly Project. The tea party took place on 25th August 2018 at Happ Cafe, a very beautiful Instagram-able flower cafe. To be honest, I was WOW-ed by all the decoration on that day. Everything was so pastel and pink. Every corner of the cafe including the food and desserts were so photogenic. It's like attracting you to hold up your camera and capture everything there. Just look at the dessert table! So PRETTY! 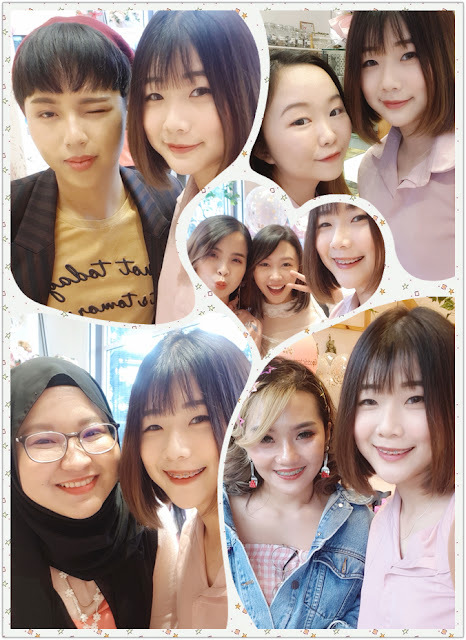 A very warm welcome photo session at the dessert table. Thanks to Eros for capturing such a nice photo of everyone. Actually at that moment, it was very awkward because I was the first person to get a photo during the welcome session. I was a bit confused and that was why I personally thought that my pose for this photo was a bit awkward. Luckily the photo turned out to be good, thanks to the photographer of the day, Eros. The very nice product's shot by Eros again! Ya, I know most of the photos up till now were from Eros because I literally think that his photos were hundred times better than mine, lol. So these were all the lip products featuring at the tea party. I really love the product's setup because the light made the products looked even more elegant. There were 12 colors in total for their LipAddicted series and all of us had the chance to actually try out all the colors. The event started with a warm welcome opening speech by Leonard and Sydney. Brand introduction was presented by the brand representative from SoAddicted. 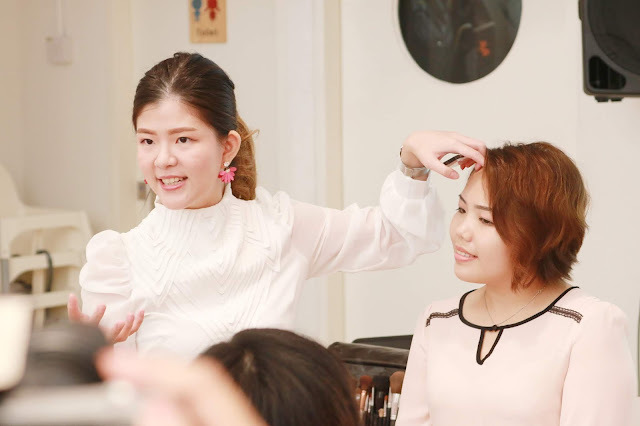 She also introduced more about LipAddict products in details. There was also a Demo Session by the Makeup Artist, Fibiee to show us on how to create a Daytime and Night Time look by using products from SoAddicted. 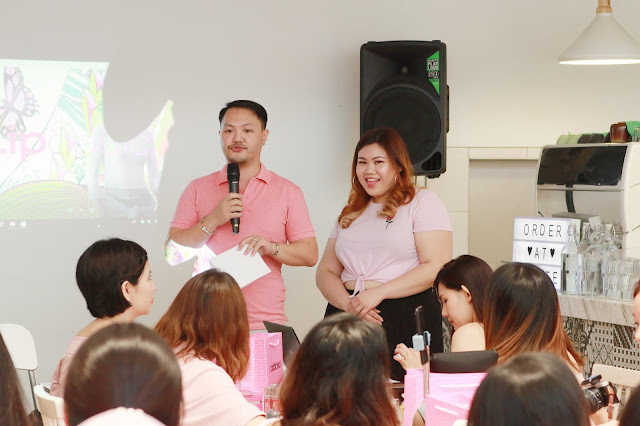 She also shared that by using LipAddict lip products, we can mix and play with the lip colors to create our very own lip colors. 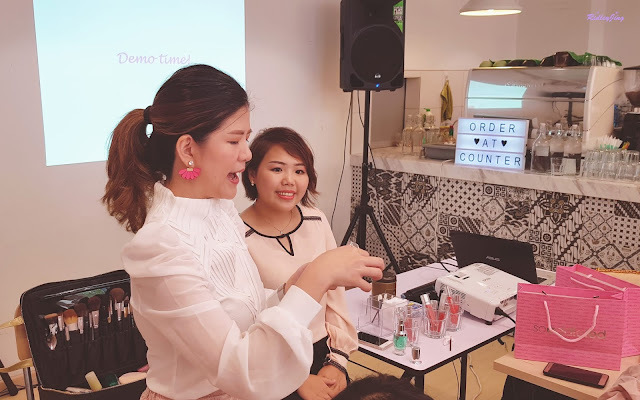 And yes, everyone got the chance to play with the lip colors! There was a reason why all these pretty colors were on our table! It was for us to play around with the colors by mixing it! Of course we also swatched all the 12 colors on our hand! Thank you Zoelie for "sacrificing" her hand as a model to showcased all the lip colors! It took some time to setup this by her and it was so pretty! I chose 3 colors for the mix and sadly I forgot to note down the colors I chose. The colors I chose were more towards a warm tones. I personally prefer the colors on the left as it's more beige and suitable for daily application. SO, LET's MIX IT UP! It became this color after the mixed. It was a bit "orange-beige" for me. I personally thought that the color was nice because it was neither too bright nor dull. It was very average and suitable for daily application. It was a very girlish color and at the same time it was not that stand out. 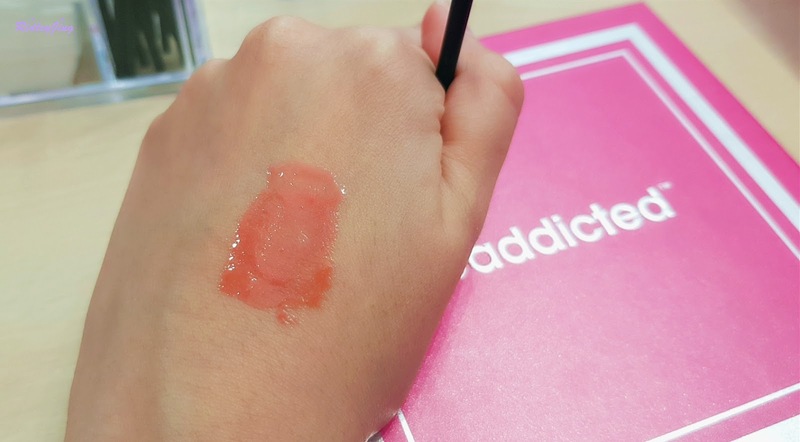 After I applied it on my lip, it appeared to be a little bit brownish compared to the swatch on my hand. But the colour was still pretty and... YES! I will used it for my daily makeup. Also not to forget the "makan-makan" session during the tea party! Still remember this dessert table? All these pretty desserts were edible ya! Although all of it looked like a deco item, it was edible! And the dessert table was almost emptied out by all of us during the makan session because I only got to eat few macaroons and also some cakes. Other than desserts, they also prepared some light food for us to fill our stomach! 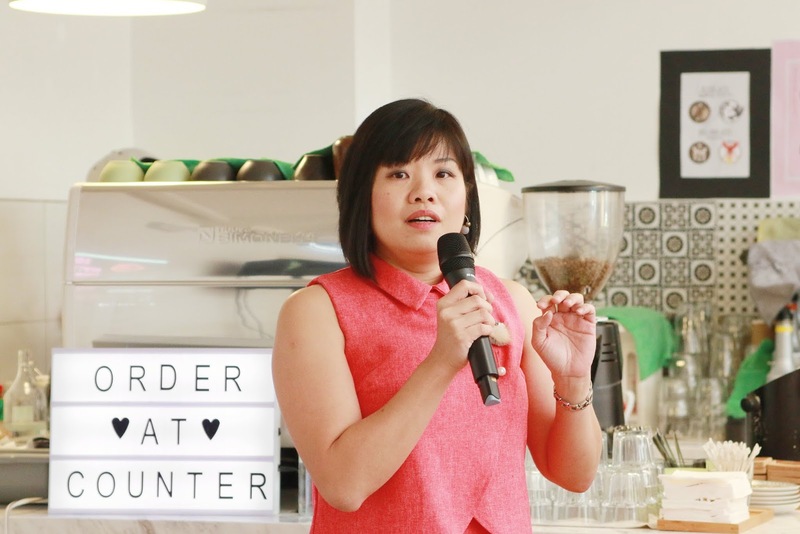 They prepared some salads, fried wonton, cakes, macaroons and etc..
Other than getting to know the brand and having the "makan-makan" session, we also got the chance to mingle around with the other butterflies. It was a good chit-chat session with all of them because I only able to meet them during events (mostly...). Used up all the free time to catch up with them. I really like the tea party because the party concept was so pretty and the cafe was so cozy and comfy. The party session was not too packed and food was provided as well as the dessert. Last but not least, a big group photo to conclude my tea party post section! Ehhh, I'm not yet done with my post! 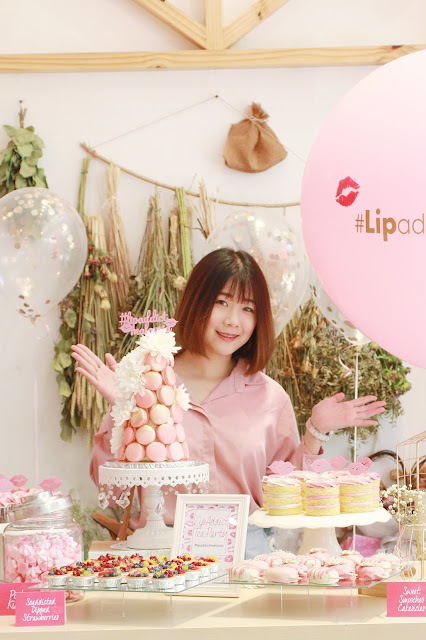 NOW, let's talk about the LipAddict Products that I received at the Tea Party! Before I begin to review all the 3 lip colors, I would like to introduce more on the brand. I believe that most of you never heard of SoAddicted, well at least I never heard of this brand. This was actually my first time to get to know about this brand. The brand was established in year 1999. Their headquarter is located at Canada but their products are formulated at their lab in United States, so I can say that their product is made in USA. "A better, more natural you!" So, if you are looking for a natural, cruelty-free anti-aging products, this is the right brand for you! 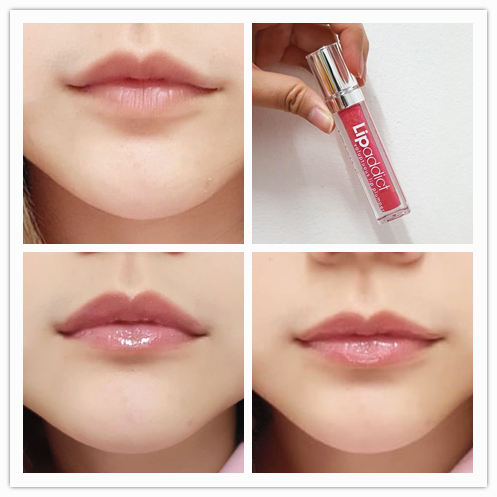 The main focus for this post will be their Lip Addict series. It is a multi-purpose lip treatment that give you a more healthy, hydrated, and fuller lip. It also reduces the appearance of lip vertical line and make your lip appears smoother. To put it in a simpler term, it's a "Lip Savior"! 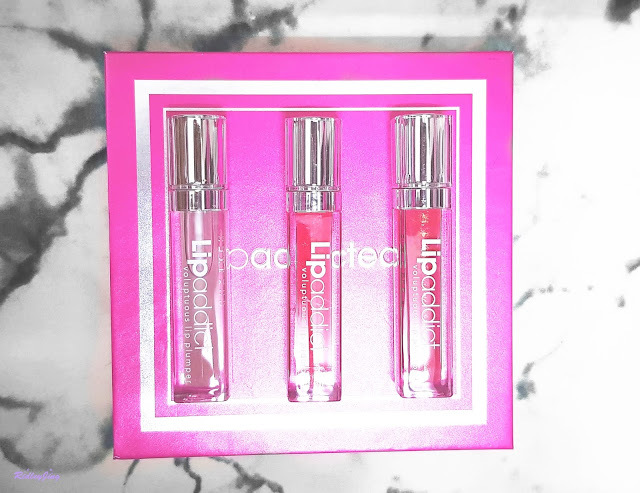 Not only it's a Lip Savior, it's also a Lip Plumper. 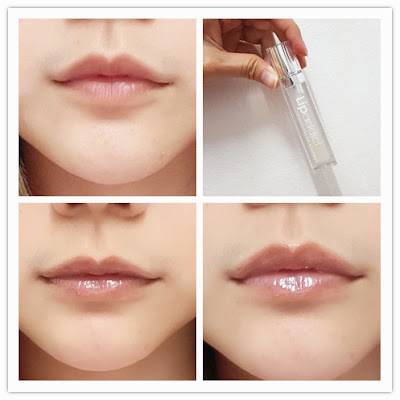 It contains ingredients such as hyaluronic acid, marine collagen and peptides that help to plump the lip by increasing the hydration and erasing the lip line by stimulating the collagen synthesis. It's also free from Parabens, Sulphates, Hormones, Artificial Fragrances, Gluten Free, Toxic Ingredients. Since it is comprised of only natural ingredients, it is safe to be ingested and if you are pregnant, you can still use it! Without further ado, let's try it out! Although the color looks more red in the container but after applied it on my lip, the color looked like a light natural pink. It gave a natural pink color add on to my lip so my lip color won't be too dull. 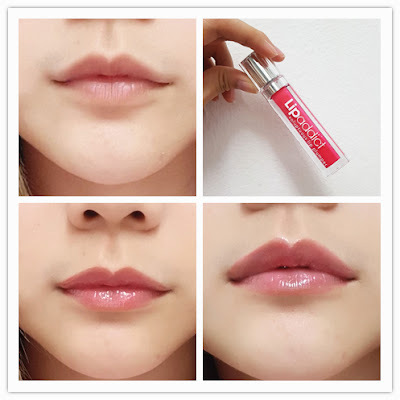 After I applied it, I can see that my lip became plumper. I used it almost everyday in my daily makeup to work. This color, it has a gold shimmer in the pink color. The pink was not that obvious compared to the #206 Pink Princess. Maybe it was not that visible in photo, but the gold shimmer was very obvious in real life. But as the time goes by, the gold shimmer will disappeared, left only the light pink tone on my lip. This is the color that I want to try the most although it's transparent. I was very attracted to the point that it can be used as a night lip treatment during the night time before sleep. I used it almost every night after I got it and my lip does look a bit healthier and pinkish. It also hydrates my lip during the night time because the air-conditioned room really dries up my lip. As you can see in the photo, it just add on the shiny effect without any color. So I can actually put it on top of any lip color as a lip gloss too. For daytime makeup, I personally prefer #206 Pink Princess. The application is quick and easy, with just a glide, my lip looks fuller and hydrated. 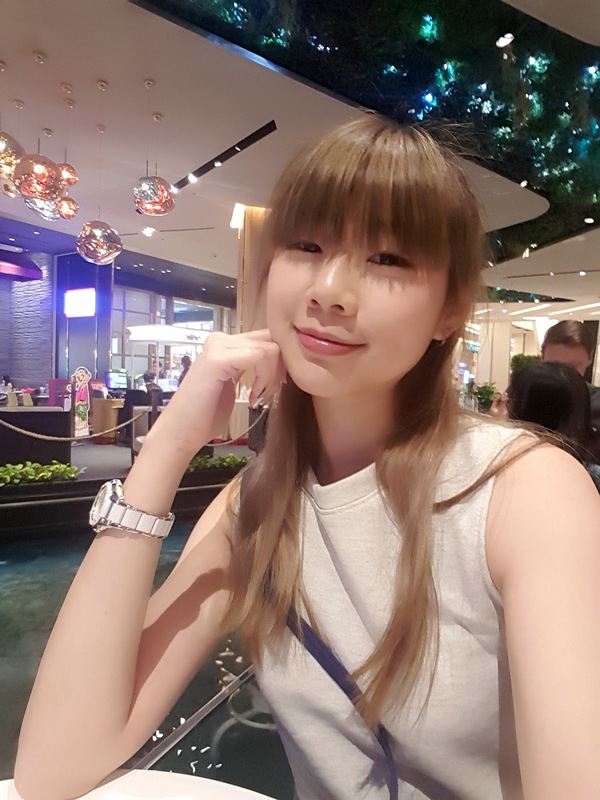 It looks good with my daily makeup. As for night time, #213 Jewel is my choice. I really like to use it as night lip treatment. My lip feels hydrated and of course it did reduce some of my my lip vertical lines. My hair always stick on my lip after I apply the lip tinr. The product was priced at around RM165 per unit. It was a bit expensive for an average buyer like me. 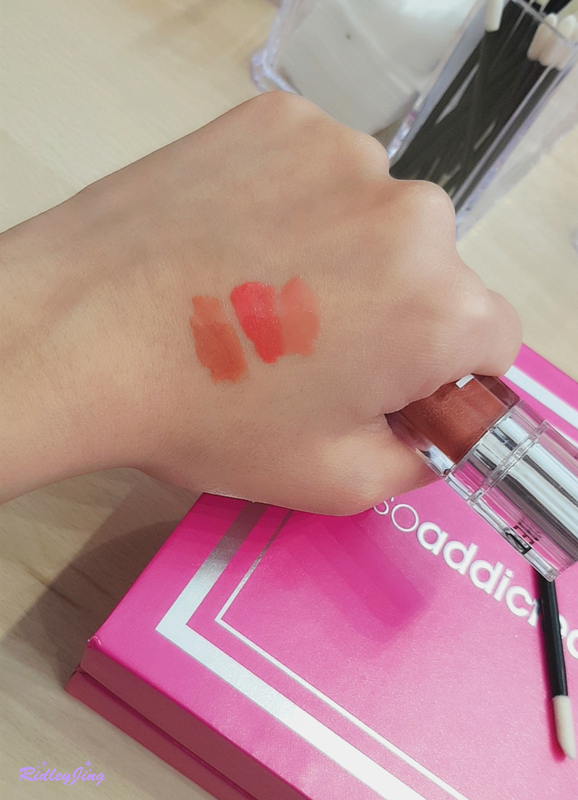 Although it's a lip savior, I still need to think twice before I buy it. The price tag is a bit too high for me, but if I have the extra money, maybe I will consider it. You can either get it online or at the below listed locations.